Guide to layer paint to build shadow and form. click images below for larger versions. Digitals are not great so don't rely on their color. I first stretched cotton duck canvas. 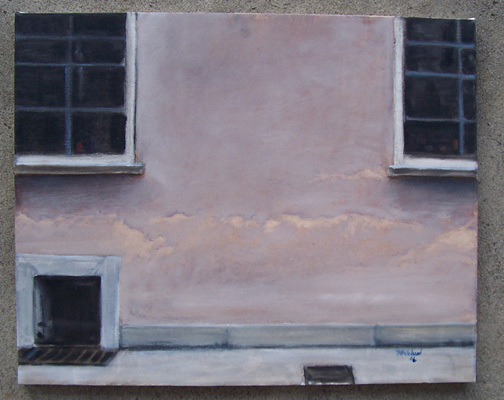 Its medium weight, but weight doesnt really matter for a painting like this. Working from a two digitals I decided on the layout of objects and what type of wall I wanted. Its fairly close to reality, but its not so important as this technique can be applied to anything really. 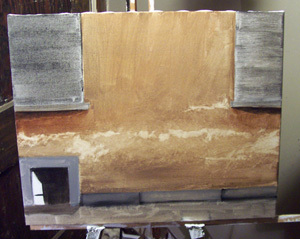 In the first step I quickly painted in some lines showing the forms with some brown paint - I don't remember the specific brown, but its not important. I then mixed a background warm color that consisted of mostly Raw Sienna and Burnt Umber and washed it onto the rest of the canvas with a lot of thinner. I just wanted to get something wet down and wasn't worried about forms, shadow, etc. After the wash I then built in my shadows with burnt umber and then used a little black for the deepest shadow areas. 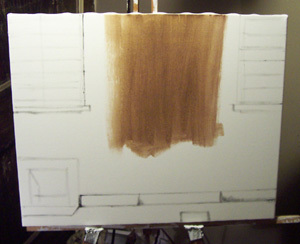 Any dark color could be used instead of black, but the burnt umber under the windows will build a nice warm shadow. 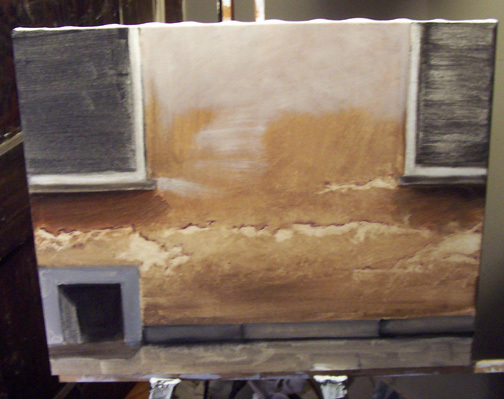 Hazardly I left some stroke marks and also blended the shadows a bit. 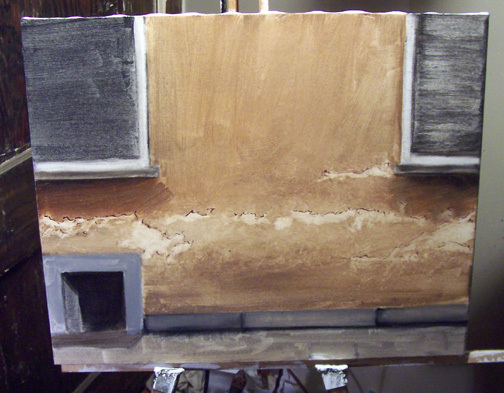 I filled in the windows and moldings with a wash of black. 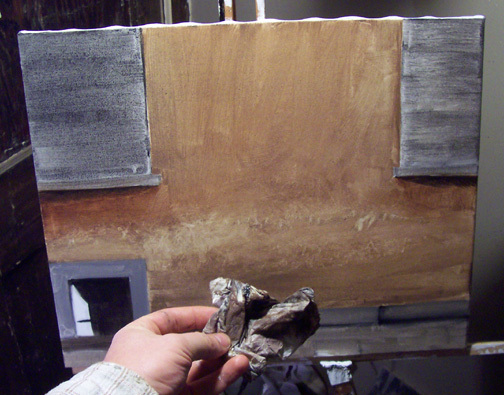 To show some variation in color I washed over the bottom part of the wall with a slightly more grey color and using a crusty paper towel removed some of the paint in the middle area where the story is told about this wall. With a clean brush I dipped it into my thinner and randomly painted the lighter marks on the wall and instantly soaked up the paint onto a paper towel. This sucked out the paint is areas and left what you can see in the picture. To give the white areas some definition I painted a very thin squiggly above them with a dark color; I chose violet and blended it a little right after this picture. 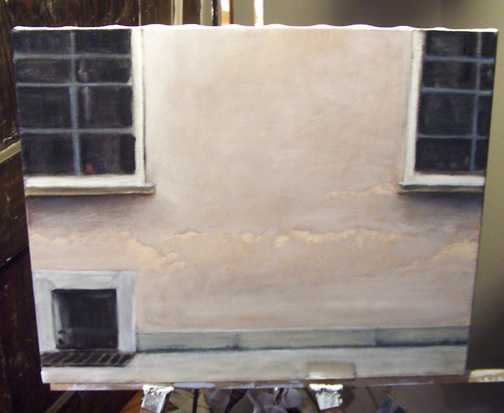 After done here I let the painting dry for 6 hours (or more if wanted); this will allow the colors to get solid and the washes won't wear off with pressure from a brush. 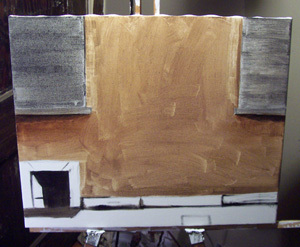 Very carefully I mixed a mostly white color that consisted of white, naples yellow, burnt umber, orange, and purple. With a wide semi soft brush I applied the white completely dry (no thinner) over the canvas carefully adjusting the application amount. Less on shadow areas and more on open areas. I didnt paint this new white over those yellowish worn areas as heavily as the rest - basically the same as the shadows. With a different white (olive/mud white) I did the same thing with the other stone parts of the painting as seen. I painted in the dark parts of the windows and left the moldings the wash color. With the window moldings I ran a blue over them to give some shape, but nothing real exciting as I want the attention on the wall to compete with the windows. There it is all done.